Cookies yummy enough to replace a birthday cake! I am feeling a little blue today. It is my birthday today. No, I am not feeling blue because I am a year older… even though I can’t believe how old I am. You see it is Mike’s birthday today too and he is traveling, so we will not be together this year for our birthday. It is the first time since we have been married that we are not together on our birthday. On a side note… how cool is that to have the same birthday as your spouse!?! Mike is the only person that I had ever met that shared my birthday. I can say that he has never forgotten my birthday. He will be back tomorrow, but it is not quite the same. I know that it really is just another day, but yet it is a special day no matter how old you get. Oh, well we do have plans for the weekend, so I am sure that it will all work out. Enough about feeling sorry for myself. I didn’t make a cake for our birthdays, but I do have some amazing cookies to share with you. I think these cookies might be just a bit better than birthday cake anyway. This is the first time that I have made chocolate chip cookies with oatmeal and nuts. 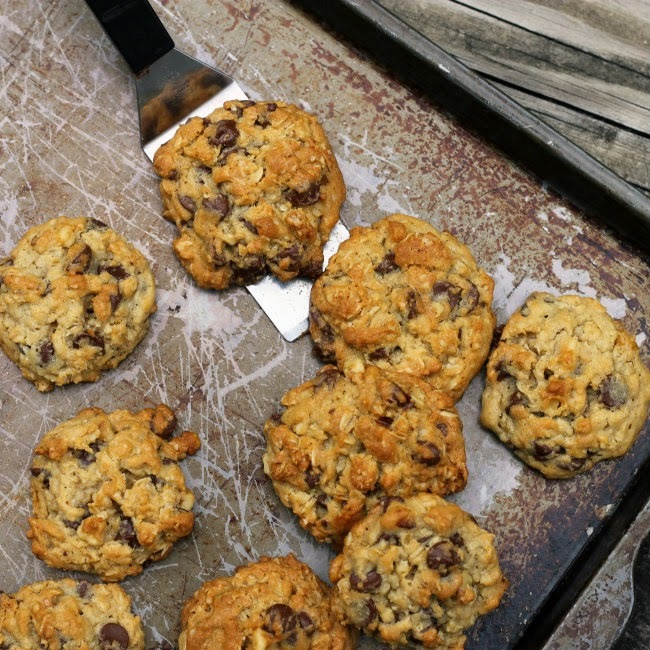 Seriously I have been making the same chocolate chip cookie recipe for about 25 years. Not that I haven’t wanted to try these before now, but there is a certain member of the family that has always said that they didn’t like oats in their cookies… I won’t name names. I remember as a kid my grandma always added walnut to her chocolate chip cookies and I loved them. So after decades I am finally trying it myself. I love the walnut in these cookies as much as I loved my grandma’s cookies. 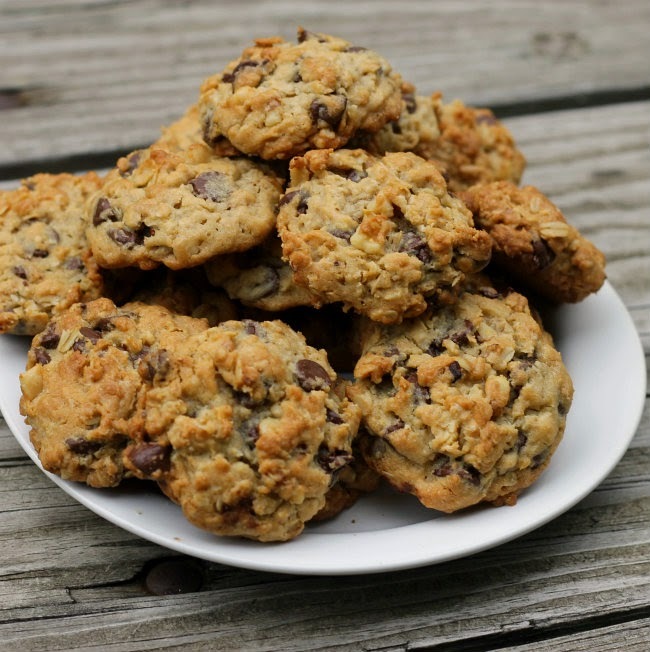 And by the way that person I didn’t name… who always said that they didn’t like oatmeal in their cookies, they love these cookies and have requested for me to make them again. Which I know that I will. They are so yummy, I can’t stop eating them. 2. To a large bowl add the butter, shortening, brown sugar, and granulated sugar with an electric mixer beat until creamy. Add the eggs one at a time and mix until well blended. To this mixture and the vanilla and mix until well blended. 3. To a medium bowl add the flour, baking soda, salt, and oats and stir together. Gradually add the flour and oat mixture to the creamed mixture. Mix with the electric mixer until all is incorporated. 4. By hand or wooden spoon mix in the chocolate chips and walnuts. 5. Place on slightly greased baking sheet by heaping teaspoons. 6. Bake in the preheated oven for 12 to 15 minutes. Remove from oven and set on cooling rack, after cooling a minute remove from baking sheet and set on cooling rack to cool completely. Tiene un aspecto bien crujiente. 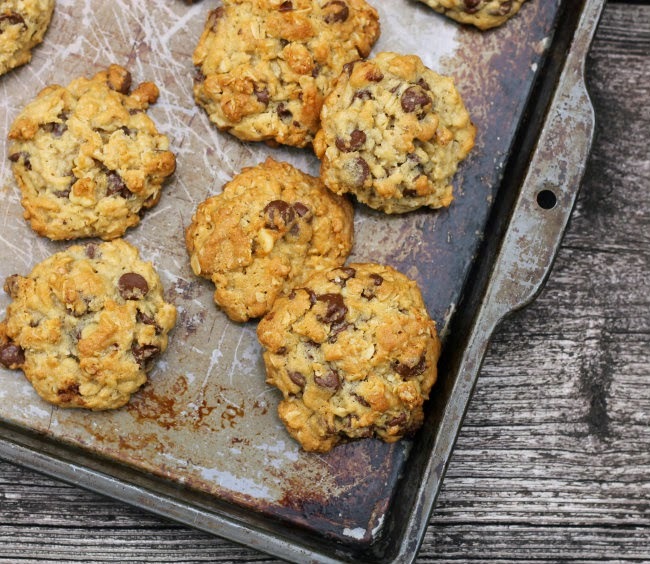 I do add oats to my chocolate chip cookies but not nuts. Think I’ll try both next time. 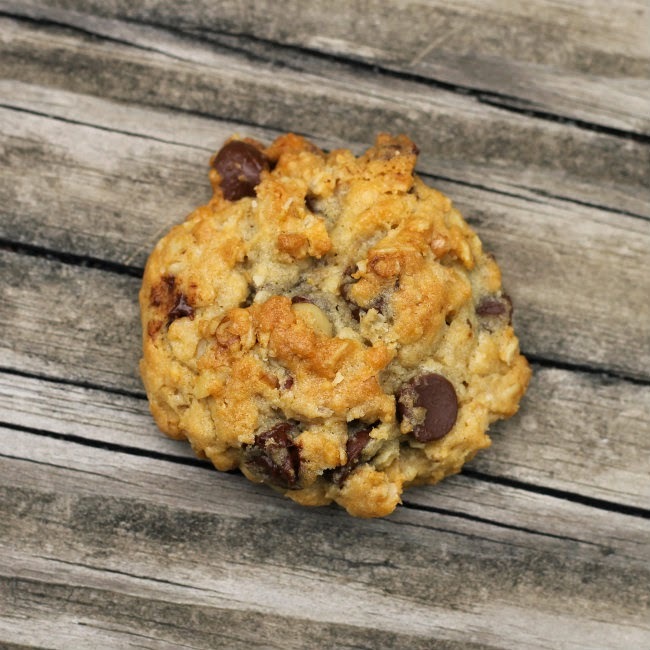 These cookies sound and look great…like the oats and the nuts in it…and awesome shots! Awww happy birthday!! That’s how you know you two are meant to be. 😛 What awesome cookies! Love that they have chocolate chips AND oats. Any cookies with chocolate in it, have to be a winner. These look delish.